Blog Quick Quotes: Delight in the Day with Louise! Delight in the Day with Louise! Greetings Quick Quotes readers! Louise here with a scrapbook page about my son's 8th Grade Graduation. I found this page particularly challenging. We were in a hurry and didn't do a photo shoot in advance, so all I have is these photos taken from an auditorium seat. To further challenge me, the school colors are forest green and white and the Vice Principal is wearing a bright red dress. 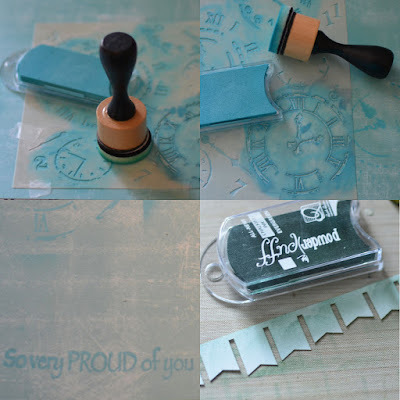 I ended up combining papers from the Whistlin Dixie and Spring Showers collections to get a color scheme that worked with these photos. I started with the blue background of the Whistlin Dixie 106 paper. Although this paper is a subtly distressed blue print, I decided to use Bermuda PowerPuff Chalk to add some additional interest to it. Using a clock template and my ink blending tool, I used the PowerPuff Chalk Ink in Bermuda to add clocks to the paper. I moved the template around adding clocks and pieces of clocks in different places on the paper. This is easier than it seems, since the ink is only a little darker than the paper, there is no way to mess this up. Using the same ink, I stamped a small quote near the bottom. 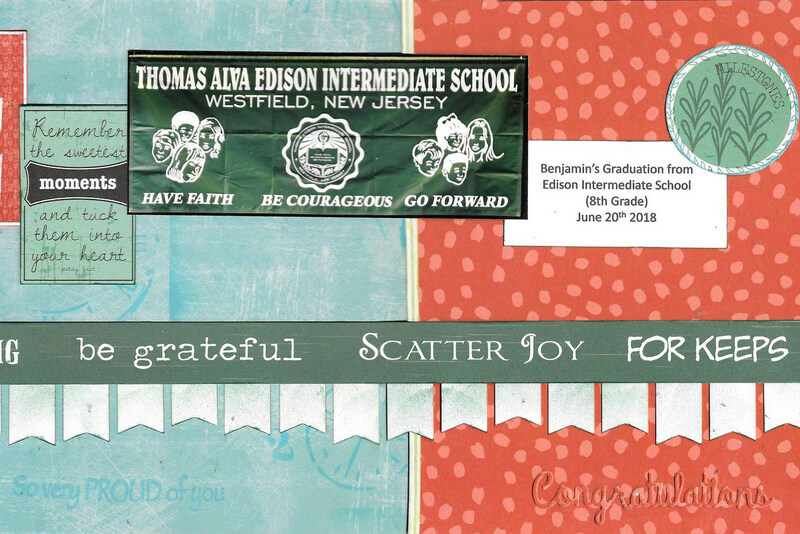 The banner across the bottom was a leftover die-cut from the February Club Q. I used my ink blender tool to apply PowderPuff Chalk ink in Evergreen to the banner. I added a little more ink directly to the bottoms of the pennants. To put the page together, I cut a 5 inch strip from the reverse of the Spring Showers 105 paper (red print). I die-cut the word Congratulations from the leftover section of this print to use later. To smooth the transition between the 2 papers, I added a very thin stripe from the Spring Showers 101 paper, edged with PowderPuff Chalk ink in Cactus. 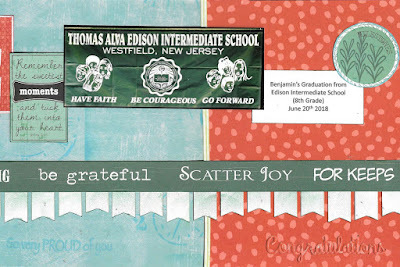 I created an embellishment cluster across the middle of the page using sayings from the Whistlin Dixie 500 sheet combined with my journaling and a photo of the school banner. To finish the page, I added the die-cut word onto the red paper so that the red-on-red die-cut balances the blue-on-blue stamped quote. It seems unusual to be scrapping school photos in the middle of summer but I really wanted to get his middle school album done before he starts high school this Fall. I hope I have inspired you to tackle some of the challenging photos in your stack.